Miller Claude Price age 82 of Morristown, passed away Friday, May 11, 2018 at his residence. 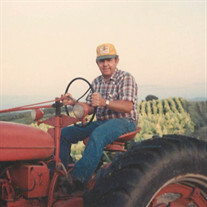 He was a lifelong dairy farmer in Hamblen Co., the oldest member of Rocky Point Baptist Church, where he served as Deacon, Trustee, past treasurer and a choir member. He was also a member of the Hamblen County School Board for 12 years, member of the Soil Conservation Board of Hamblen County, Lions Club of Hamblen County and the Burley Stabilization Corporation. He had a love for traveling, his family and his church family. Claude leaves his wife of 60 years, Ann Easley Price, Sons: Leslie (Pam) Price and Robert (Lezlie) Price, grandchildren: Blake (Alicia), Matt (Mary Katherine), Grayson, Braeden and Shafer Price. Great grandchild: Evy Rose Price; brothers-in-law: Jerry Hixson and Virgil Leonard, and several nieces and nephews. The family would like to extend special thanks to Smoky Mountain Health and Hospice; and caretakers, Megan, Melissa, Sherman, Daffney, and Stacey. The family will receive friends Monday, May 14, 2018 from 4:00 PM until 6:00 PM at Rocky Point Baptist Church with a celebration of life service to follow at 6:00 PM with Rev. Ross Woody officiating. In lieu of flowers, donations are requested to Rocky Point Baptist Church. 2297 Silver City Road, Russellville, 37860 or St. Jude's Children's Hospital.